Electrical Steel Market Analysis « Global Market Insights, Inc.
With the rising shift towards renewable power generation systems and growing adoption of zero-emission EVs, electrical steel market has garnered renewed momentum in recent years. Electrical steel is basically an iron alloy tailored to generate specific magnetic properties for various industrial and commercial applications. The product is particularly used for making power transformer and has found long-term application in the EV industry for making efficient, high-speed electric motors owing to its ability to reduce energy loss, improve efficiency, lower CO2 emissions and hysteresis loss. The rising demand for high-torque electric motors in the shipping and construction industry has further propelled the growth of the electrical steel industry. How will the energy sector turn out to be a revolutionary driving force for the global electrical steel market? The ever-increasing global demand for reliable and environmentally friendly energy sources has pressurized the solar PV sector since the last few years. Solar PV panels basically convert sunlight into electricity, however, due to its output’s DC nature and low current offering these power stations require efficient distribution or static converter transformers to step-up the electricity to drive high-voltage AC applications. The rising focus on curbing global CO2 emission has also encouraged construction of zero-emission solar PV power stations. For instance, reports from Solar Energy Industries Association (SEIA) claim that around 10.6 GW of solar PV capacity was installed in the U.S. in 2018, reaching a 64.2 GW of total installed capacity, enough to power 12.3 million U.S. homes. Reports further suggest that the region’s total installed solar PV capacity is expected to go over double by 2024. As the demand for renewable surges, the requirement of transformers at solar PV power stations and similar establishments is bound to increase, thereby propelling the electrical steel industry trends. The extensive expansion of the global EV industry is likely to have an impact on the electrical steel market trends, given that the material is widely used in manufacturing high-speed, power-efficient motors, a primary component of any electric vehicle. Rapid technological developments in motor technology has also propelled the industry growth. It is thus certain that the rising investments in motor manufacturing will boost the electrical steel market share in the coming years. Citing an instance to back the aforesaid, in 2018, electric supercar maker Rimac Automobili announced its investment of around EUR 5 million (USD 6 million) for setting up a new manufacturing facility in Xiangyang, China to solely produce electric motors and batteries for its EV segment as to meet production capacity of 50,000 units/year. As is observed, major companies have been making extensive investments to up their EV manufacturing graph, that is bound to lead to an augmented growth depiction for the electrical steel market. China is anticipated to emerge as a highly lucrative revenue pocket for the global electrical steel market. One of the primary reasons for the region to depict an incline in the growth potential is the extensive deployment of grain oriented electrical steel. Indeed, these products are known to convert energy into power voltages to be deployed across various power generation systems. In China specifically, these products are extensively used in household appliances and rural and urban networks, that has helped accelerate their demand in the nation. 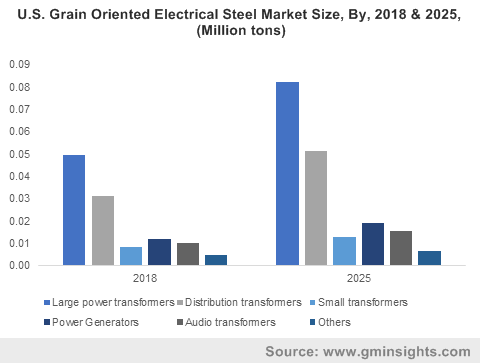 As a matter of fact, China grain oriented electrical steel market size from household appliances will be pegged at over USD 95M by 2025, driven by the spate of novel innovations in household appliance manufacturing. The China electrical steel market is also expected to witness momentum from the rising standards of living and the increasing per capita income of consumers that has led to escalating power distribution network in the region. Moreover, the focus of several electric automakers to set up manufacturing facilities in the region owing to its vast technological know-how will accelerate the electrical steel market growth. For instance, global EV giant, Tesla, Inc. has started constructing its Gigafactory 3 in Shanghai which would make electric motors and battery packs for its current and upcoming segments by 2020, in turn supplementing the electrical steel market. Primarily used to produce cores of transformers, motors and generators, electrical steel helps enhance permeability, magnetic flux density, and minimize energy loss, on the grounds of which it is extensively used in the energy, manufacturing and automotive industries. Reports from Global Market Insights, Inc., claim that the electrical steel market size is estimated to surpass $22.5 billion by 2025. This entry was posted in Polymers and Advanced Materials and tagged APAC Electrical Steel Market, Audio Transformers, Canada Electrical Steel Market, Distribution Transformers, Electrical Steel industry, Electrical Steel Industry analysis, Electrical Steel Market, Electrical Steel Market 2019, Electrical Steel Market 2025, Electrical Steel Market Analysis, Electrical Steel Market forecast, Electrical Steel Market growth, Electrical Steel Market PDF, Electrical Steel Market report, Electrical Steel Market share, Electrical Steel Market size, Electrical Steel Market statistics, Electrical Steel Market trends, Europe Electrical Steel Market, Germany Electrical Steel Market, Grain Oriented, Large Power Transformers, Non Grain-Oriented, Power Generators, Small Transformers, U.S. Electrical Steel Market.